High Road NO. 28 - "Dynamic Introspection"
This Australian band is quite interesting. The band is a duo of Andrew Cantwell on drums, vocals and samples and Philip Brien on guitar, bass and samples. There is a great use of samples and heavy tunes that reminds of Ministry at times. The CD opens with "Anxiety Disorder NOS". This is a really great song with some ripping guitar while samples discuss problems with the brain. The vocals remind me of someone but I can’t place it. "Just Below The Surface" slows it down a bit and is a dark depressing number with mostly stoned spoken lyrics. Great mood piece. Does this remind me of the way the guy from Dayglo abortions or the Boneless Ones sang on a few songs??? "Dissociative Paraxysm" is another aggressive almost metal crossover type song. It is nearly 10 minutes long and quite a journey as well. Again some great guitar playing on this stuff! "Time Desolation" completely changes things and is a great instrumental acoustic number. The CD ends with "Intransigent". The most intense and powerful song on the CD. This is cool stuff and I can’t wait to hear the debut album. Watch out!!!!!!!!!!! The band are currently working on their debut CD and playing out live in Australia. 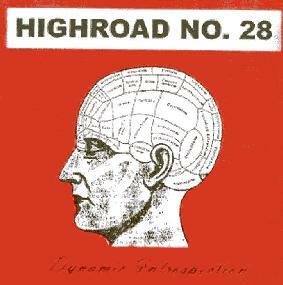 For more information you can visit the High Road NO. 28 web site at: http://www.geocities.com/highroadno28. The CD is available for $5. from PO Box 502, Parramatta, NSW 2124, Australia.